The Lower Athabasca Region Surface Water Quantity Management Framework for the Lower Athabasca River establishes weekly management triggers and water withdrawal limits to enable proactive management of mineable oil sands water use from the Athabasca River. Weekly management triggers and associated water withdrawal limits reflect seasonal variability and become more restrictive as flows in the river decrease, in order to minimize impacts on the aquatic ecosystem. 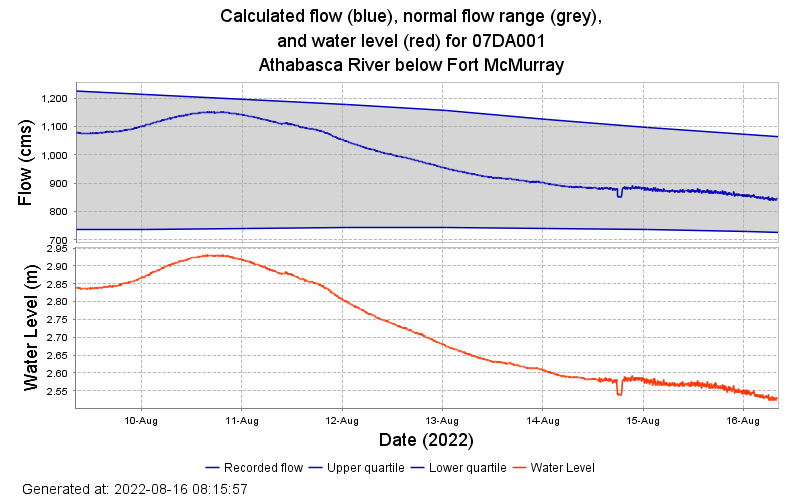 Weekly flows of the Athabasca River measured at the McMurray station (Water Survey of Canada gauge 07DA001 “Athabasca River below McMurray”) are compared to the management triggers to determine the applicable limits on how much water is available for cumulative mineable oil sands water withdrawal for each week of the year. The weekly management triggers and water withdrawal limits are divided into five seasons: Mid Winter, Early Spring, Late Spring, Summer/Fall, and Early Winter. Each of these seasons has distinct weekly flow triggers and corresponding cumulative water withdrawal limits (Table 1). Less than five per cent of the Athabasca River’s average annual flow has currently been allocated for use. As of 2018, the allocation to oil sands mining operations for water from the Athabasca River was under two and a half per cent of the river's average annual flow. Other uses in the Athabasca River Basin include community drinking water, agriculture, and industrial development. Less than one per cent of the Athabasca River flow is actually used on a net basis in the Athabasca basin as a whole. Many users do not use their full allocation at all times, and return flows to the river in the upper Athabasca River Basin can be used downstream. Actual water withdrawn by oil sands mines in 2017 was less than one per cent of the average annual flow - approximately 137.9 million cubic metres, or an average of 4.4 cubic metres per second. View a graph of the current year 2019. Real-time flow estimates during the open-water season can be found on the Alberta’s River Basins website. *Cumulatively, licensed pumping capacity for mineable oil sands projects may eventually exceed this limit. Water sharing agreements will identify how water management decisions will help ensure maintenance of the limit.